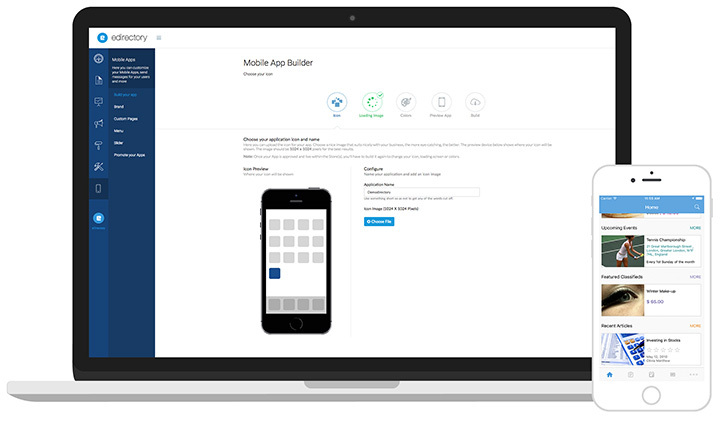 Build your application from right within our interface with no code knowledge necessary. Best of all, we'll automatically build the app for you so you, can submit to it directly to the app store yourself. The code is also 100% native to the platform device that you're building for. Mobile first is our philosophy, and eDirectory helps you capture this market with our one of a kind iPhone and Android apps that you can configure and build right through the site manager. No developers or no code knowledge is required. Simply login, and start building right away. We even have an automated build engine that will pop out a freshly baked app for you to upload straight to the store. Get your apps in the Apple App Store and the Google Play store, and your icon on the home screen after download. You can customize the App layout via site manager interface, building the Apps so they can better serve the needs of your business. Send notifications to apps easily from Google Firebase interface. This is a great way to give a sponsor some extra visibility or to promote your site. We custom crafted these apps from the ground up using Objective C for iOS and Java for Android to give them a smooth performance with exquisite interfaces fitting the platform conventions. No Phonegap or html that we pass off as an App. This is the real deal. Build and submit the apps yourself to the Google Store and Apple App store directly from the Site Manager. To save time, order our VIP submit service, and we'll do it for you. Data in your apps is always up-to-date, as they pull directly from the eDirectory database. When a listing is updated for the web, it's updated in the app immediately as well. *The stores classify our apps as tablet compatible but users may experience some instability as they are originally developed and promoted as Phone Apps.